Serving Military Service Members, Friends and Family Since 1999! 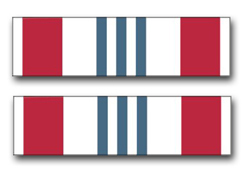 This Army Defense Meritorious Service Ribbon 3.8" Vinyl Transfer Decal is an ArmyDecals.com exclusive. Proudly Made in the USA, our Vinyl transfer decals are made of the highest quality vinyl and UV resistant graphics available and are laminated to provide extra protection against the elements. Our U.S. Army Decals are the highest quality decals on the market! Each transfer decal was designed so they can be displayed with pride on your automobile windshield as well as used for various applications such as hard hats, door signage, shadow boxes, vehicle signs, air planes, motorcycles and motorcycle helmets and much more. This vinyl transfer decal is made for OUTSIDE APPLICATION. Each is made at our facility in Scottsboro, Alabama.